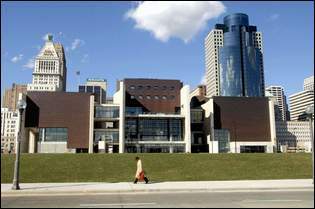 One of the keystones of the new riverfront development in Cincinnati is the National Underground Railroad Freedom Center. It's a visually stunning building, commemorating those who risked their all to free Southern slaves before and during the Civil War [at least I think that's what it's for]. The Freedom Center is now facing a financial crisis, in only its second year of existence. CEO John Pepper is trying to raise $10 million in additional funding, which would include funds from state and local tax-payers to keep the Center operational. So here's my problem with the Freedom Center: it's dumb. I say this as someone who has visited the center within the past year. Before you jump on my case to call me a closet racist, allow me to make an assessment on what's wrong with the Center. First, my experience. I was excited to visit the Freedom Center. Like I said, the building is an architectural masterpiece inside and out. But once you get inside, there seems to be nothing but hype. On the second floor [there's nothing on the first floor but the gift shop], there is an impressive log cabin from Mason County, Kentucky that served as a slave holding cell. It was a powerful visual message of what slaves must've gone through. But beyond that, there wasn't much on that floor. There were a bunch of pictures hung on the wall detailing stops from where slaves would be shipped, but that was about it. Oh, there was a weird animated movie with Angela Bassett doing the narration but that was really it. It was very disappointing. On the third floor there was a museum display you could walk through, but it was chaos. I have no idea how they decided to organize it. The displays weren't even in chronological order, jumping around between random events. They had a few interesting historical artifacts, but not nearly enough. On that same floor they had an obligatory diversity section, where you were supposed to learn how to be accepting of minorities. But I found that it to be a waste of space. The type of people inclined to visit the Freedom Center probably aren't the people who need the diversity training. Perhaps I was expecting too much. Although I've never been there, I've seen video of the National Civil Rights Museum in Memphis and was very impressed. I imagined that's what the Freedom Center would be like. And I think that's what people expected it to be. It's as if the people who run the Freedom Center viewed it as a "Field of Dreams" structure ["build it and they will come"] and it hasn't quite worked out. Honestly, unless they make major changes to the displays, I cannot imagine returning. 1) They spent too much on the structure and not enough on the content. Actually, I love the look of the building so I should strike that first part, but I still believe they skimped on the displays. This Center could be so much more but they cut some corners. What they need to do is reorganize, refocus, and make the Freedom Center a place where people will want to come back to. The NURFC is a living and learning center in Cincinnati offering lessons and reflections on the ongoing struggle for freedom. In addition to celebrating the historic efforts of the Underground Railroad, the Freedom Center will also showcase the efforts of modern day heroes--men and women from around the world. My opinion: they concentrate way too much on the now. I saw more junk on changing the world today than I cared to see. The Center's organizers are insecure about letting history speak for itself. It is condescending that they interpret the lessons of the past for people, not letting them draw their own conclusions. I guess my gripe here is that there was a liberal slant in quite a few exhibits that had nothing to do with anything but pushing a certain political/social agenda. I came to experience history, not to listen to patronizing diatribe. Maybe I'm right, maybe I'm wrong, but I actually want to see the Freedom Center succeed, so my criticisms shouldn't be dismissed too easily.